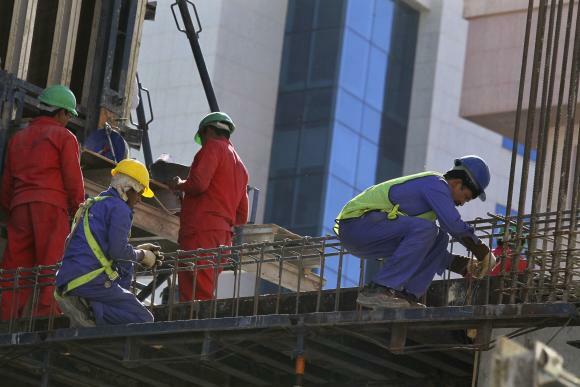 Foreign labourers work at the construction site of a building in Riyadh November 27, 2013. Reuters – Saudi Arabia will punish people who employ foreigners illegally or break the terms of their visas, in an effort to encourage local employment. Punishment ranging from fines and jail terms to confiscation of assets and deportation may be imposed, escalating a year-long crackdown on visa irregularities that have been overlooked for decades. The interior ministry decision was carried on the official Saudi Press Agency on Monday. Police raids and an amnesty on fines for immigration violations last year caused over a million foreigners to leave voluntarily. Their departure was followed by the deportation of hundreds of thousands of others, mostly Ethiopians and Yemenis. It is not clear how many people with invalid visas remain in Saudi Arabia. Some economists estimate it might stretch to millions of people. Around 20 million Saudis and 10 million foreigners live in the kingdom. Riyadh hopes that stricter enforcement of visa rules will encourage hiring Saudi nationals, by making it harder and more expensive to employ expatriates, who tend to be cheaper than the kingdom’s own citizens. Saudi visa rules stipulate that all foreign workers must be sponsored by their employers and cannot work for themselves or other companies or individuals. The government says expatriates who set up their own businesses or work for companies that do not sponsor them deny jobs to Saudis and make it harder to enforce quotas for local and foreign staff. Saudi unemployment is officially around 12% for Saudis, but that figure does not account for the 60% to 70% working-age people who do not hold jobs and are not actively seeking work. Economists have warned Riyadh it needs to boost private- sector employment, because eventually it will be unable to reduce joblessness through public-sector hiring, as it sometimes has. Labour Minister Adel Al-Fakeih said in January the crackdown on visas coupled with sweeping reforms over recent years has doubled the number of Saudis in private-sector jobs since mid 2011. However, a large number of those without proper documents are thought to be manual labourers and domestic servants, jobs that most Saudis do not want. Economists have also said it is unclear whether the policies will ultimately create sustainable jobs, and they have caused short-term disruption, particularly in the construction sector. Foreigners working for themselves or overstaying their residence visas face a fine of SAR 10,000 ($2,667) and deportation for a first offence, rising to SAR 50,000 fines and six months in prison followed by deportation for three offences or more. Immigrants who entered Saudi Arabia illegally will be fined SAR 15,000 and jailed for two months before deportation for a first offence, rising to SAR 100,000 and six months in prison with deportation for three or more offences. People who smuggle or transport illegal immigrants will be fined SAR 25,000-100,000 and have their vehicle confiscated. Prison terms range from six months to two years. Those who employ or aid foreigners without proper visas, and sponsors who let them work for themselves or other people, face fines of SAR 15,000-100,000, a freeze on hiring expatriates and prison terms of up to six months and deportation. Additional penalties are imposed for licensed pilgrimage operators that fail to report when people coming to Mecca or Medina for Haj do not return to their countries. Countries with large numbers of citizens working in Saudi Arabia include Yemen, Egypt, Sudan, Ethiopia, Pakistan, India, Nepal, Sri Lanka, Indonesia and the Philippines.